THIS VERY SPECIAL PAGE TO HONOR THE LIFE OF JOHN ZALEDONIS. John Patrick Zaledonis was born in Baltimore, Md., on September 14, 1984, and was a graduate of Spring Grove High School, Class of 2003. He played high school baseball and for the American Legion. Baseball was his life. 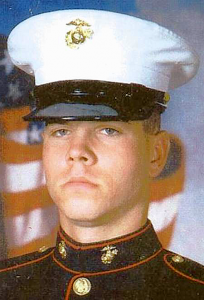 John honorably served his country in Iraq with the U.S. Marine Corps. He settled in Plano, Texas, and was employed as a personal trainer for L.A. Fitness in Plano. John passed away August 27, 2011, in Plano, Texas. He was 26.